ROKPA offers a variety of activities to help vulnerable children, especially those with disability. Hundreds of thousands of children are still in need of basic care, support and education. We have years of experience in working with children with disability, their parents and siblings, and fruitful relationships with other organisations in this field. 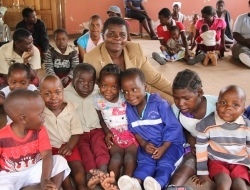 Opened in October 2013, Chitungwiza Center, is a broad spectrum crèche and relief day care facility. The crèche provides care to the children with disability, providing them with 2 meals a day and improved and professional care. The location is also used to provide an after-school club which gives school children a place to play or sit and study in the quiet. Chitungwiza is Harare's oldest and largest low-income suburb. The ROKPA building functions as a relief day-care facility. Parents and carers of kids with disabilities leave their children there and meanwhile have time to work and earn a living for their families, who otherwise live in extreme poverty. Often, the food that is provided to the children at the centre is the only food they get during the entire day. Completion of construction of a toilet for children with disability, a kitchen, some furniture etc. Allowances for the coaches and care-givers. School Related Assistance (SRA): Aims to prevent vulnerable children from dropping out of school. We cover the cost of school fees, assistive devices including wheel chairs and other related items. Basic education is an asset – and a right - for all children and helps them participate in decision making. Children with special needs get the chance to learn independence and self care. Life Skills Camps: Each school holiday, we organize a five day life skills camp, where disadvantaged youth are paired with young adults who have been trained as assistant-facilitators. Topics covered include reproductive health, HIV prevention, gender awareness, children’s rights, communication, child participation, skills identification and the importance of a healthy diet. We aim for equal numbers of boys and girls, both able-bodied and those with disabilities. Help the vulnerable children from dropping out of school – Sponsor their education!